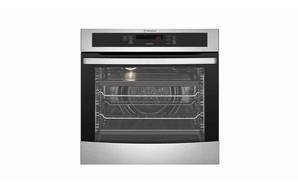 Snapshot: The Westinghouse WVEP618S single oven has pyrolytic self-cleaning. But how did it perform in our test kitchen? Has very easy-to-use touch controls. Cooking functions have pre-set temperatures and are easy to adjust. Grill tray rolls out smoothly into shelf support and has stoppers. Visibility through the oven door is excellent. The stainless-steel exterior is fingerprint-resistant (so it’s easy to clean). Has a child lock for door and controls. Accurate temp control. Good pizza setting. Even cooking. Easy installation. Clock setting is not intuitive. Very accurate temp control. Good pizza setting. Very even cooking. Easy installation. Setting of clock counterintuitive but otherwise easy to use controls.